Those words are not coming swiftly, or at all, right now. So, I go to my backup plan. I pull my copy of To Kill a Mockingbird by Harper Lee off my shelf. If you want to know more about Banned Books Week (and you do!) 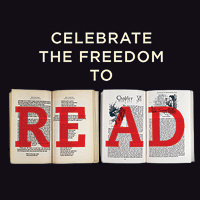 visit the American Library Association’s Banned Books Week site. I say to all readers, bloggers, and book lovers — read that banned book! I think celebrating our freedom to read by picking up one of these books is as much of a stance as a thousand books. Love your “take that”. Exactly. Read those books you are told are questionable, your friends hesitate to tell you about, or deal with tough topics while staying true to life.